The Philippines has two internationally recognised programs in the Open Government Partnership (OGP) and both fall under the "Citizen Participation" commitment. 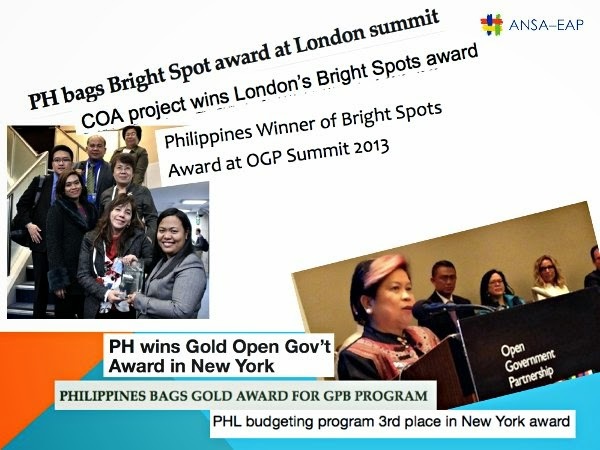 These are the Citizen Participatory Audit (CPA), which won the Bright Spots prize in London last 2013, and the Grassroots Participatory Budgeting (GPB), which bagged third gold award in New York this year. I realized the Philippines' global strength and contribution in citizen participation while preparing a presentation for an OGP regional event in Phnom Penh, Cambodia last October 16. I joined this event on the invitation of Indonesian organizers-- Indonesia is taking leadership in the region-wide mobilization of East Asia and Pacific countries to join OGP since the conclusion of its OGP chairmanship. From eight member countries in 2011, the OGP now has 65. This is the collective body that has bestowed honors on the innovative governance ideas from the Philippines in two consecutive years. The Philippine government categorized its 19 OGP commitments into the four thematic clusters, namely improving compliance with transparency, deepening citizen participation, escalating accountability, and technology and innovation. Under citizen participation, it listed four commitments: (1) participatory budget roadmap, where civil society can participate in budget preparation through the Budget Partnership Agreements; (2) local poverty reduction through the GPB, where civil society and community organizations can collaborate with local government in developing local poverty reduction action plans; (3) Empowerment Fund, which will support capacity development for citizens to demand better services and governance; and (4) participatory audit, which aims to craft a roadmap to institutionalize citizen participation in audits. These commitments under citizen participation noticeably have strategic features. First, they are positioned in the public finance management (PFM) processes. The GPB alone covers planning, budgeting and spending; the first and the fourth commitments cover budget and audit, respectively. Second, there is clarity in purpose; the GPB, for instance, has expressed goal to address local poverty. Third, the government is realistically concerned about the need to enhance the civil society's capacity to participate considering that the PFM could go very technical. Fourth, there is effort to provide resources to make the participation happen. Finally, the responsibilities for implementation are shared with various agencies, such as the departments of budget and management, interior and local government, social welfare development, and even the audit commission. The implementation of these citizen participation programs was pursued by passing the necessary policy directives, such as the memorandum on BPA and joint memorandum circular on GPB. Consultations and partnership building with civil society were likewise initiated proactively by various agencies. A CSO Desk or similar facility was set up in agencies, such as budget and management department, to deal directly with civil society matters; COA has a project management office for CPA. International donors also contributed, such as the case of COA's participatory audit, which was supported by an Australian government project. Most importantly, these commitments underwent periodic review and assessment, which allowed the partnership to see how they are working. ANSA-EAP actually did the assessment for the BPA, INCITEGOv and CODE-NGO for GPB, and CPA was regularly reviewed and even subjected to a shared agenda building exercise with various stakeholders. The results of these commitments were properly documented in the reports to the OGP and were also evaluated by an Independent Reporting Mechanism (IRM). There had been notable gains in the Philippines' citizen engagement commitments under the OGP, except for the Empowerment Fund, which had been negatively affected by controversies around the use of fake NGOs as conduits of pork barrel funds. Though at varying effectiveness, the BPA has enrolled the participation of 30 CSOs in budget preparation in 2012 and 61 in 2013. It resulted in the inclusion of around US$285 million additional infrastructure and housing budget due to CSO influence. The GPB generated 595 local poverty reduction action plans (LPRATs) in 2013 and 1,226 in 2014, though 2014 project implementation completion still stands at 19%. The CPA has also produced four pilot audits in flood control, health and solid waste management projects. The Philippine government's efforts in involving citizens in governance, a social accountability trademark, have indeed gone a long way and countries around the world are taking notice. While it is not free from major problems in corruption and poverty, it has promising governance reforms and innovations that it should be proud of. These governance reforms and innovations should be cherished and nurtured, not just for the recognitions they have brought, but for the commitment to the principle of openness and participation that they represented and the hard work that both civil society and government exerted to fulfill the commitment.